We would love to help you host your next event, it is our speciality after all. We have three different rooms to choose from. Check them out below, and when you're ready, send inquiries to info@thewashhouse.com or call us at (251) 928-4838. If you're interested in hosting an event throughout the entire restaurant, we can host up to 200 seated INSIDE (this number does not reflect the outside courtyard that would also be available) with a shut-down fee of $1,000 and a $10,000 minimum spent on food and beverage. This room is beautiful with hanging and twinkling light. 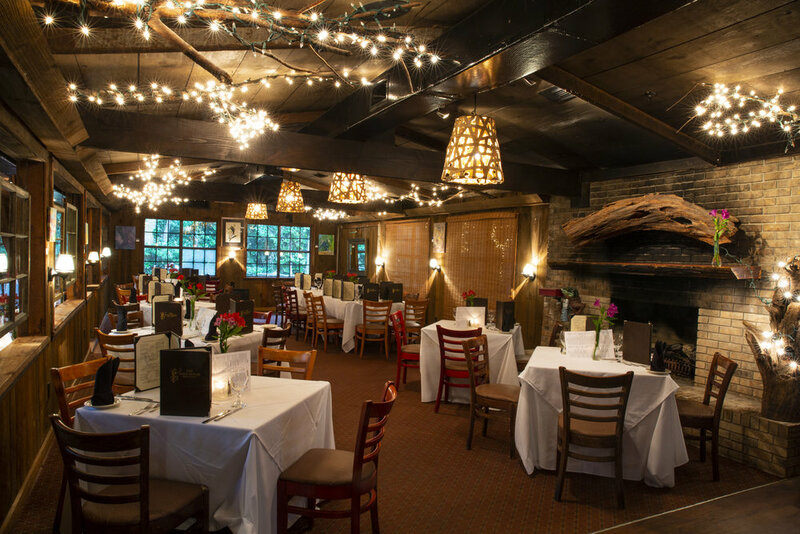 Our Main Dining Room holds up to 100 people and can host all reception style events for weddings, parties, anniversary gatherings, business functions, etc. This room boasts a comfortable atmosphere with a fireplace and a private bar. The Lodge can seat up to 70 people. The room fee is $500 with a $3500 minimum on food and beverage. This room is quaint while holding all the charm of the combined Lodge and Main Dining Room. Up to 40 people may be seated in here with a $250 room fee and no minimum on food and beverage.